As seen in Acts 2, when the Gospel is experienced people are moved to awe-filled worship, authentic community, and infectious mission. These three areas are how the transforming grace of God are evidenced among the people of God and how God uses His people to engage people with His love and transform their communities. As Paul says in 1 Corinthians 3:18, "...beholding the glory of the Lord [we] are being transformed into the same from one degree of glory to another. Realizing that we are far more broken and wicked than we ever imagined yet we are far more loved and accepted than we ever dared dream; our hearts are melted and we fall deeply in love with Jesus. This propels us to worship Jesus in our everyday lives, personally, and together in gathered worship. Worship is our “chief end” in which we glorify God by enjoying Him forever. Gospel worship is to be governerned by God's word and expressed in awe, reverence, and joy. The Gospel breaks down all the natural and sinful barriers between people. We are given the tools for continual love and reconciliation. In the Gospel we are united in purpose and mission. The full implications of the gospel are enjoyed as we relate to one another in our weakness, brokenness, repentance enjoying together God's mercy, love and forgiveness. In the context, true community can exist where we can build one another up, encourage one another, and love one another. As people redeemed, transformed, and enjoying the gracious love of God, we long to see others experience the same joy and freedom found in the Gospel. God calls His people be a part of promoting the Gospel to the world. We are called to be the conduit of God's redemptive truth and love. For us this involves several joyful commitments: 1) living missional lifestyles, 2) relational evangelism, 3) seeking the welfare of those God has placed us among 4) local and global church-planting missions, 5) care for the poor and demonstrating the transforming power of the gospel in the broken places of our society, and 6) cultural renewal moving into the communities, marketplaces, and the arts as representatives of the Kingdom of God. We gather together to celebrate the great things God had done, is doing, and promises to do. We sing together and remind each other of the good news of God's grace. We hear God's word proclaimed, respond in giving, and in celebration at the Lord's Table. In the New Testament the church is described as a "vine", "body", "building", and "household/family". All of which picutre the connectedness and interdependence we are to experience together as God's people. We believe that discipleship and mission is best accomplished as believers live together in community. These communities are small groups of people, joined by the realities of the gospel, pursuing the renewal and redemption of their community together. 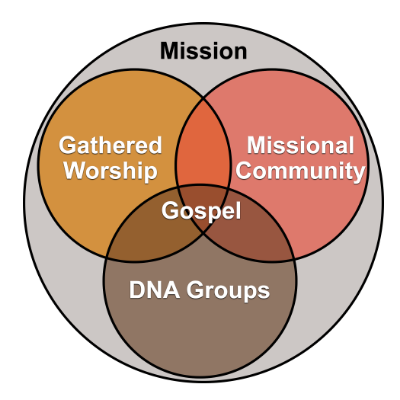 We call these communities "missional communities"--communities who live the gospel together spreading the gospel together. In these communities we seek to dive deeper and deeper into the gospel, encourage and care for one another, and work to serve the community we are a part of, creat space for non-believers in our midst, and share the good news of Jesus with love. While discipleship definitely occurs in our missional communities, there's a level of encouragement that can only happen in a more intimate, same gender context. This can occur in our DNA groups. The person and work of Jesus Christ are to be the center and ground for all of life and ministry. His atoning sacrifice which satisfied the justice and wrath of God and resurrection from the dead declare those who believe to be forgiven, declared righteous, and victorious over sin, Satan, and death. It is this truth that the church is to be centered upon. We can only know the saving work of Jesus through the words of the Bible. Therefore the Bible is our sole authority. The Bible is inerrant, infallible, and the only rule for faith and life. “Since the Holy Scriptures are the only infallible rule of faith and practice, the principles of public worship must be derived from the Bible, and from no other source.” (BCO III. 47-1). The Gospel is the power of God to salvation to every person who believes and lives by faith in the finished work of Christ beyond their own attempts to save themselves.. The Gospel transforms us from living as slaves and orphans and invites us to live as God’s sons reflecting the image of Jesus redeeming every part of the fallen creation to the glory of Christ. It is because of Jesus’ perfect life, substitutionary death, and resurrection we receive justification, adoption, and sanctification for God’s glory. Emphasizing being an equipping and sending station for God’s people to be missionaries in their contexts loving and serving their communities. Our primary organizing structure will not be around attractional programs, but people gathering together in community for worship, discipleship, nurture, and mission (serving and loving the people in their context). The gospel creates a new community in which sinners being transformed by God's grace can love, nurture, encourage, and challenge one another towards love and good deeds. This community is to display the wonderful freedom we gain in Christ to be honest, transparent, and authentic while confessing sin and seeking God's help in repentance. Our greatest satisfaction in life comes, when motivated by our love for Jesus Christ, we exercise our gifts in serving others. Every member of the body of Christ should seek to fulfill the Great Commission by making disciples and participate in the ministries of God's church. The follower of Christ is to live with the same attitude that Jesus had while on earth giving himself as a sacrifice for others. The Gospel is offered to everyone irrespective of their status in life, their economic situation, their race, or gender. We are to respect others while remaining faithful to the Word of God equally loving persons of all races, classes, ethnicities, and genders not showing any favoritism. The church should also be as accessible as possible to outsiders while always remaining true to God’s word. The church must always look to the next generation seeking to raise up a new generation that is captivated by the gospel of Christ, equipped to serve, and empowered to do ministry. However, the church is also a part of a long, rich history and should be shaped by that tradition. Most particularly looking to the rich heritage of the Christian faith. Vintage Grace Church is a mission of the Presbyterian Church of America (PCA). The PCA is a family of churches that are doctrinally Reformed and governmentally Presbyterian (connectional and elder led). Below is a summary of our core beliefs, which are developed in more detail in the Westminster Confession of Faith, the Westminster Larger Catechism, and the Westminster Shorter Catechism. All Scripture is self-attesting and being Truth, requires our unreserved submission in all areas of life. The infallible, inerrant Word of God, the sixty-six books of the Old and New Testaments, is a complete and unified witness to God's redemptive acts, culminating in the incarnation of the Living Word, the Lord Jesus Christ. The Bible, uniquely and fully inspired by the Holy Spirit, is the supreme and final authority on all matters on which it speaks.